What Is a Lean Canvas and Why Use One? - A.Y. Technologies Inc.
What Is a Lean Canvas and Why Use One? A Lean Canvas is an adaptation of a Business Model Canvas by Alexander Osterwalder, created by Ash Maurya in his book Running Lean. It’s a plan for entrepreneurs focusing on problems, solutions, key metrics and competitive advantages. 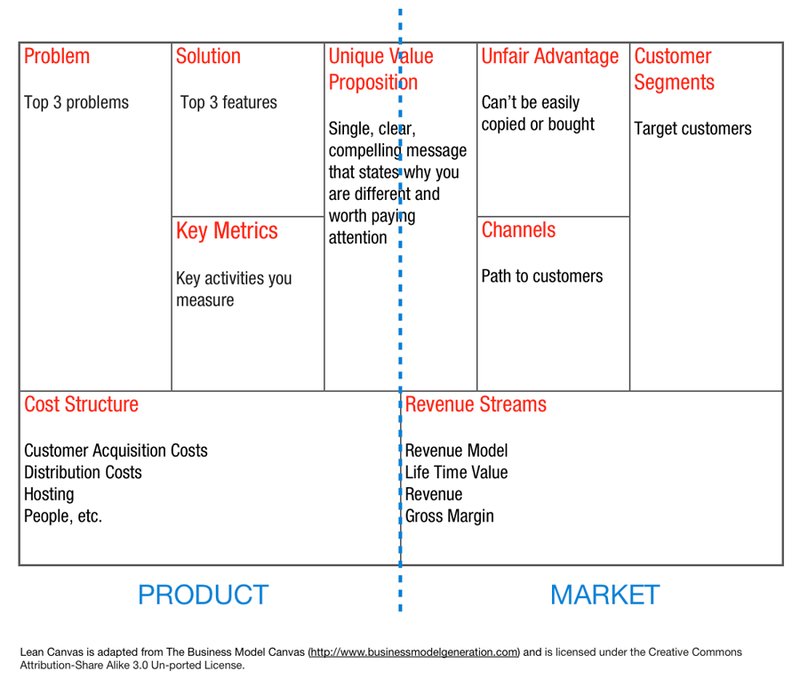 It’s similar to the well-known Business Model Canvas but with some key differences. In this article we will look at the Lean Canvas, why you would want to use one and what differentiates it from a Business Model Canvas. Ash Maurya tends to emphasize one key point above all else: That most new products fail. They fail because entrepreneurs are biased. They are solution-centric and tend to reach for their individual greatest strength to fix problems. Ie. Developers will try to build their way out of a problem, designers will design their solutions and marketers will present marketing solutions. The answer is to love your problem, not your solution. Ash wrote an entire blog post on just this very subject, you can read it here. Most learning typically happens at the end of the product development cycle, at the release stage when the product actually makes it into the hands of the end user only to find that what was built doesn’t solve anything or doesn’t solve it well enough. It isn’t innovative and doesn’t provide true value to the customer. When we do this, we may not be getting to the heart of what the problem truly is. It’s not the customer’s job to know what they want. So what do your customers really care about? They care about a unique value proposition – or the value you provide. This is essentially what the Lean Canvas is all about. This is the Lean Canvas. A single page layout, broken into 9 boxes that, at a glance, defines the following: problem, solution, key metrics, cost structure, unique value proposition, unfair advantage, channels, revenues streams and customer segments. Notice that the solution takes up a relatively small portion of the canvas. That’s because building the solution is generally not the problem… the other eight areas are usually the ones outside of our comfort zone. But how is this different from a Business Model Canvas? 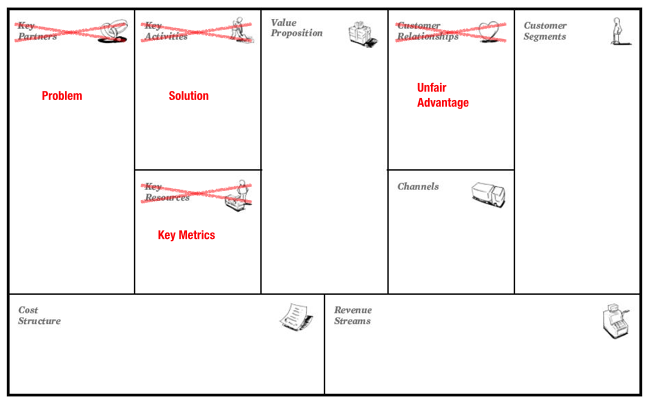 Above is the business model canvas, and when compared to the previous image you can see that 4 things have been changed. Customer Relationships = Unfair Advantage. The result of these 4 simple tweaks puts more emphasis on the problem and the people the product is designed to solve for. The true product of the entrepreneur is not the solution but a working business model, one that focuses on working out the kinks in that business model over time. You do that in 3 easy steps. Brainstorm a set of possible Lean Canvases. Start with the root of a problem, a possible solution and possible customers. Create multiple canvases for each possible customer segment and spend no more than 15 mins on each. The power of the canvas lies in its ability to pinpoint areas with the most unknowables – or risk. Tackle that unknown first. Ironically, we tend to do the opposite when we defer things like identifying markets, channels or pricing. We’re more comfortable focusing on the solution. But that’s usually where the risk lies… somewhere in the problem. Once you know what you need to learn, the next step is to set up a series of experiments designed to uncover some answers to these great unknowns. This is all about talking to people, conducting interviews and usability tests. It all ties back to falling in love with the problem, not the solution. Look at the job/task the customer is trying to get done and study how they are currently getting it done. If the job is adequately getting done, it may not be worth pursuing, but if you find that a job isn’t getting done “well enough”, or there is serious room for improvement, that is a potential opportunity. Identifiable obstacles getting in the way of customers achieving their goals is where you find the space for innovation. As you can see, the Lean Canvas isn’t just a spin on the Business Model Canvas but is a different canvas altogether. The creation of the problem box generates the biggest mind shift. It addresses the biggest pitfall from new products and new entrepreneurs. Most ideas are solution-centric and we already know the answer to that. Want to delve deep? In A.Y. Technologies’ 2 Week Roadmap Workshop, we cover how to use the Lean Canvas models effectively when developing your product idea. We teach you how to ask the right questions, define the problem and develop your MVP. Lesley is a caffeine dependent life-form with an eye for pixel perfection. Her skill set is varied, including user experience design, user interface design, creative strategy and content creation. She helps clients discover the behaviours and expectations of their audiences and opportunities for lasting impressions.